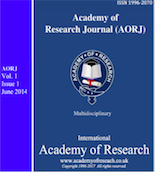 ‘Academy of Research Journal (AORJ)’ is an internationally double blind peer reviewed quarterly journal, published by Academy of Research (AOR). AORJ publishes quality papers that significantly contribute towards; Leadership, Marketing, Advertising, Strategic Management, Human Resource Management, Organizational Behavior, Supply Chain Management, Operations Management, Managerial Accounting, Corporate Finance, Managerial Finance, Management Information Systems. This entry was posted in Nocategorized on June 22, 2014 by admin.